The Stirling Street Arts Centre is a Bunbury City Council owned and maintained building. The Centre is located amongst the trees and next to Queen’s Gardens in Bunbury, Western Australia. 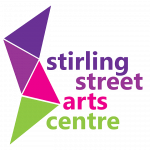 The premises are managed by the Stirling Street Arts Centre Management Board. Boasting a history rich in community involvement since being built to house the original Bunbury Infants School from 1917-1967, the building has been a learning centre servicing Bunbury and surrounding districts for over 80 years. In 1976 TAFE students built a full pottery room, using material from the old school which was situated on what is now the car park near the Paisley Centre. The centre was first named the Bunbury Arts Centre, but in 1989 the name changed to Stirling Street Arts Centre. Starting with only 3 groups, the centre has grown in popularity and the range of arts and crafts available with 15 groups now meeting on a regular basis. The Centre also hosts several community groups using the premises as a meeting ground for fitness, book clubs, and other arts & crafts activities.